I love going into ethnic food stores in search of any kind of meat snacks because I'm always eager to get away from the onslaught of teriyaki jerky that saturates the US market. I found this brand of hot beef jerky from Hsin Tung Yang. Hsin Tung Yang specializes in chinese-style food, mostly snack foods. It got its start in Taiwan in 1967, it wasn't until 1979 that they opened up a USA-based subsidiary. I've been familiar with this brand for quite some time because my mother is Japanese and she loves chinese-style snacks like this beef jerky. 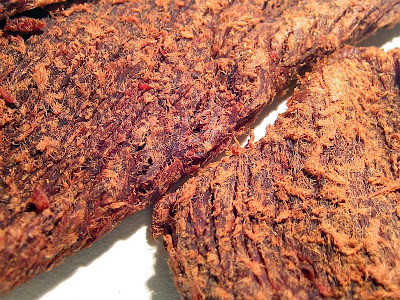 The Chinese and Japanese have a love affair with beef jerky, mostly because they see it as an American snack, and are always longing for American culture. They tend to prefer their meat snacks spiced up, or soured up, or with fruit flavors, instead of the more bland teriyaki and original varieties that Americans usually buy. Beef, water, soy sauce, sugar, green onion, spices, chili powder, sodium nitrite. The first taste I get from the surface is a sweet, almost fruity taste. The fruit is similar to that of strawberry, but not exactly. Moving into the chew, I can pick up some salty, and some of the natural meat flavors. That sweet-fruity taste only seems to be on the surface and dissipates fairly quickly, though it does seem to linger as a background taste in the chew. For being advertised as "hot flavored", I don't really see this as being hot. It does indeed have a spiciness to it, but even at that it's faint. I'm not sure the difference between "hot" and "hot flavored", but suffice to say this is actually mild on my hot scale. The natural meat flavors have a definite presence in this, but it has more of an "asian" flavor, if you can understand that. It doesn't taste much like the American beef jerky, but is something you might come to expect from a Chinese restaurant. I don't know how to put it into words. I find it pleasant, and having a fresh taste. This does not taste too salty, despite the higher sodium content. I find it moderate tasting. As for the other seasonings, I don't really taste much chili powder, and taste none of the soy sauce, and none of the green onion. I'd say the dominant taste of this jerky is the natural meat flavors, followed by that sweet-fruity taste off the surface. The saltiness has the third strongest taste in this. Overall, it's a good tasting jerky, though I don't find it as "great". This appears to be slices of whole meat, sliced average thickness, and in medium sized pieces. It's a soft and tender jerky, though not necessarily moist. It's quite dry. In fact, it's very soft, tearing apart with my fingers with little resistance. It chews very easily also. The pieces have a "furry" texture on the surface that appears to be tiny meat fibers that might have been swimming in the marinade and adhered themselves. Some of those fibers transfer themselves to my fingers, and I find myself rubbing my fingers clean. 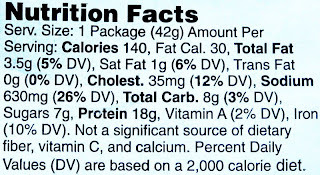 Otherwise, I found no other residue from this jerky. The meat feels and chews just like real steak in my mouth. The largest piece depicted in the photo had a rather large streak of gristle along one end, but I found it quite soft and easily chewable. Otherwise, I found no fat, and nothing else chewy. I paid $1.69 for this 1.5 ounce package at a 99 Ranch Market in Irvine, CA. That works out to a price of $1.13 per ounce, making this average priced buy, but at the low end of average. For general jerky snacking purposes, it presents a great value. It provides a good dosage of flavor, if you like fruity-beef and an asian-flavored meat, and a very soft and easy to eat consistency. I'm just not totally sold on the flavor, hence I got maybe an average snackability. As a "hot flavored" variety, it presents a weak value, because this isn't hot at all. It's only mild. If you bought this thinking you'd get some "hot" beef jerky, you'll be disappointed. However, at this price you won't be too upset. While this "hot flavored" beef jerky from Hsin Tung Yang is not hot by any means, it does provide plenty of flavor, though I don't think it's something for American palates. Hsin Tung Yang isn't necessarily going after American consumers with this anyways. But if you love trying new tastes, this is something you'll want to experience. It does provide some snackability in its easy-to-eat consistency, and it's natural meat flavors, but that fruity taste on the surface has me scratching my head. I just don't expect it to be there. I could have given it a higher rating had it been more hot. I do have to credit Hsin Tung Yang with one thing, they've managed to create a very soft and tender jerky, while keeping it dry, and retaining some good natural meat flavors. 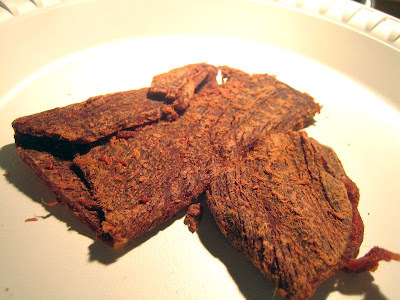 You don't often find soft and tender jerky that still tastes like meat, even though it's not the meat taste we typically come to expect here in the USA. For a good beer companion, I'd recommend an IPA.